In another section, Duhigg uses the story of Rhode Island Hospital to demonstrate how bad institutional habits can lead to toxic environments. At this hospital, habitually accepted poor working relationships between doctors and nurses culminated in a rash of horrible medical mistakes. After reading this story, it’s plain to see how haphazard workplace conventions can morph into routines that are treated like policy, even when those routines are harmful to the institution and the people it serves. Another story that proves this point is that of the 1987 King’s Cross fire in the London Underground. This story is perhaps the most appalling example of how habits formed without forethought can lead to institutional breakdown in moments when it’s most important to have a well-reasoned plan in place. In a completely different vein, the book demonstrates how retail giants like Target track our spending habits in order to gain dominion over the choices we make. I confess. I make it sound more sinister than Duhigg does. While I don’t intellectually mind the fact the Target sends me coupons for things it knows I buy, this section of the book gives me the heebie jeebies, even though the science involved is fun and interesting. I feel a bit hunted, cornered, duped, even though I never use any of the coupons Target sends me. (I’m a habitual coupon forgetter, or perhaps I should say I have failed to form appropriate couponing habits.) David and I have been talking a lot about the negative side of our consumption-worshiping society lately, and this section of the book stirred all those emotions right up into my chest. 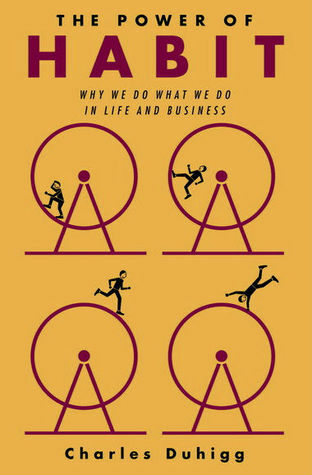 As the book moves on, Duhigg moves farther and farther away from the realm of personal habit, which is so concisely related at the beginning, into the habits of movements and subcultures. The main example he uses here is the Montgomery Bus Boycott of 1955, started by Rosa Parks. While the events and people that Duhigg discusses in this section are compelling and inspiring, I think he loses the thread here. I’m not sure I follow exactly how the power of this movement relates to the power of habit laid out so neatly earlier on in the book. It feels like he’s trying to force material into his thesis, and, at least for me, it doesn’t work. I kept reading, though, despite this unravelling, for the story of the boycott itself. 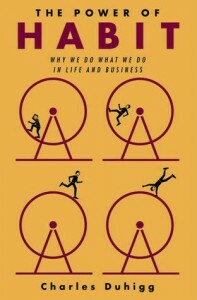 Overall, I’m glad to have read The Power of Habit despite the qualm I mention above. You should read it too, just to find out how much Target knows about you or why toothpaste tastes minty fresh. The book is bursting with stories about how people and organizations make, break, and use habits—many more than I have mentioned here. It’s fascinating. I find a silly satisfaction in the fact that people from my church picked books with these words collectively in their titles: power, nonviolent, life, beloved, servant, prayer. Ah, brothers and sisters… Do I hear angels singing now? No, that’s the theme to the Mighty Morphin’ Power Rangers. Eva and Netflix are in collusion to drive me mad. Since The Power of Habit is so popular at the library, I had to buy it for my Kindle. In all truthfulness, though, I adore reading on my Kindle. I love that you read this since I recently downloaded it on my Nook but haven’t gotten to it just yet. Thanks for sharing your review, Wendy!